No matter if you’re carrying out small DIY tasks at home or completing a big job on-site, markers, pens and pencils are a necessity for most jobs, but they are often overlooked. We have fine tip pens, paint marker pens, and a selection of highlighters, that can write on hot, rough, oily and wet surfaces, helping you to complete work with precision and accuracy. 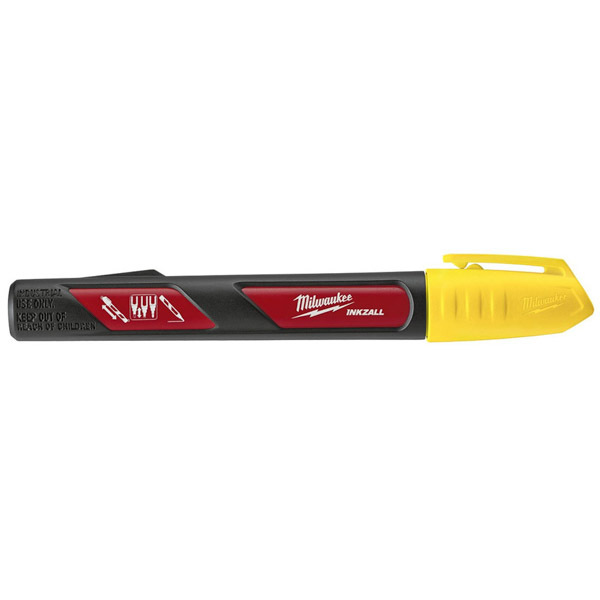 The Milwaukee range include Inkzall point marker pens,paint markers and highlighters. Available on the website are jobsite fine point marker pens and chisel point markers which are designed for writing on rough surfaces such as OSB, cinder block and concrete. You can also purchase the marker that has a stylus attached which is designed for using touch screen devices like iPads and iPhones whilst wearing gloves. Paint markers are also available and can mark on surfaces up to 300F and dries in 10 seconds. The paint markers are available in white, black and yellow. A set of four fine tip colour marker pens are available in black, red, blue and green which have the ability to write though dusty, wet or oily surfaces. We have a choice of Milwaukee markers and paint pens available, including black paint pens and white paint pens. Durable and tough, these paint pens can write on rough and hot surfaces (up to 300 degrees Fahrenheit), and are resistant to water. If you need fine tip marker pens, we stock Milwaukee fine tip pens and ultra-fine point markers, available in black or colour multipacks. Select the Milwaukee Inkzall Fine Tip Colour Marker Set for fine tip pens that can write on dust, oil and concrete surfaces. Or there is the Milwaukee Inkzall Fine Tip Colour Pen set, which have been designed to avoid smears and have slow drying tips, which is handy if you cannot locate the lid. Alternatively, we know that you need to use your phone at work but taking your gloves off to use the touch screen can be time consuming. To solve this, we sell the Milwaukee Inkzall All in One Jobsite Stylus and Black Marker, so you can use your phone on the go.